Fresh corn and tomatoes are symbols of summer, right up there with steamy sultry days and perspiring clinking drinks. So it’s no surprise that corn and tomatoes pair perfectly in this casual, summery salad. Their mutual sweetness is differentiated by the milky crunch of fresh corn kernels and the juicy acidity of sweet cherry tomatoes. A shower of parsley keep them grounded along with the bite of sweet red onion and a squirt of lime. This is summer simplicity at its best. Cut the kernels from the corn and place in a bowl. Add the pepper, onion, tomatoes and parsley. Mix to combine. Drizzle with olive oil and lime juice. Sprinkle with cumin, salt and pepper to taste. Toss and serve. That is beautiful. At first glance I thought green pepper and almost shut down but I made a point of reading and see that, no…it’s a much better pepper, albeit green in color, one I would love! What a beautiful salad! 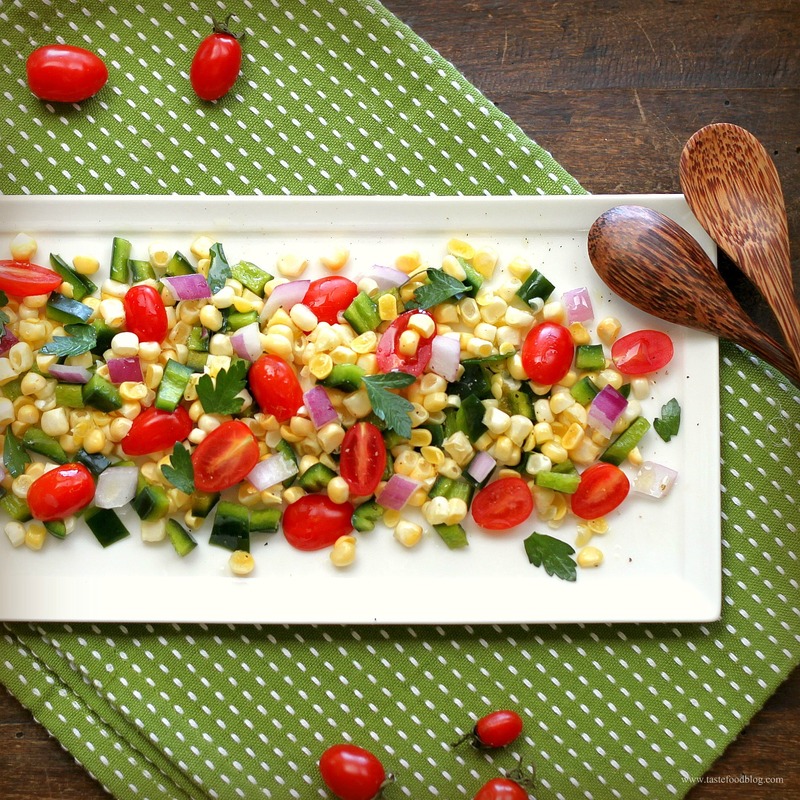 I love corn in salads – it’s such a summertime treat. A bit of cumin with it is a great idea. I love mixing tomatoes and corn. This looks like an excellent recipe, especially with a little heat. I am overloaded with basil in the garden – bugs in my parsley so I might sub basil. Pretty salad! One of my favorite summer salsas. I love your recipe and your plating is always so fresh and clean looking. I’ve only recently been turned onto raw corn salads. Where have I been all this time? Love. The presentation of this dish is just beautiful! And I second Sally’s comment…never thought of Chipotle in a salad. Sounds so flavorful! Love this salad full of summery goodness! My farmers market had tomatoes for the first time this season and I think I actually shrieked when I saw them. What a lovely salad – wonderful use of seasonal ingredients. This sound so good I love tomatoes and corn, I’m so glad you posted it as I’ve been hankering for a fresh corn/tomato recipe. I love any salad with corn in it! This looks wonderful! this looks so delicious i must try it! Made this last night with fresh corn and tomatoes from the local farmers’ Market and everybody loved it. A definite keeper. Thank you, Lynda. I’m going to a Labor Day party I hadn’t planned to today — and this is what I’m taking. I have all the stuff (corn and tomatoes in overabundance! I’ll be a hit, I know it!